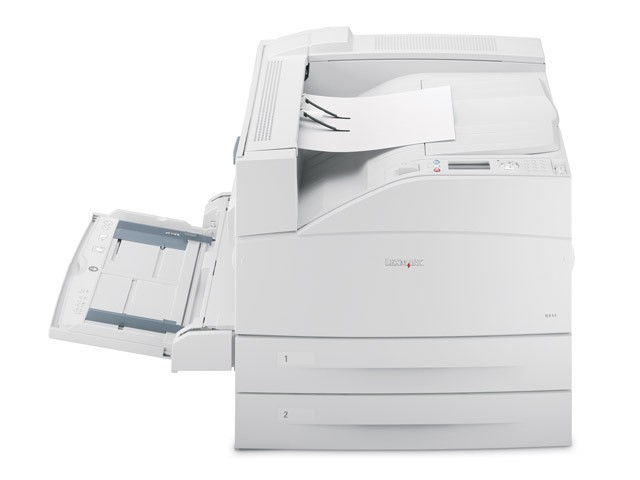 Businesses with wide-format mono printing needs will appreciate the unbeatable quality and performance of Lexmark’s W840 laser printer. They’ll also benefit from state-of-the-art security and ease-of-use. Paper handling with a maximum input of 5100 sheets and output with an optional finisher of 3800 sheets. Stapling, hole punching and job offset allow users to professionally finish documents. Wide-format (A3) capability extends in-house printing capability enabling quicker turn-around of critical print jobs. 300,000 page one-time maximum monthly duty cycle provides large workgroup support and productivity. A powerful 625 MHz processor and standard 256MB RAM (expandable to 768MB) for fast printing with up to 50 ppm (letter and A4) coupled with a time to first page as quick as 7 seconds means large jobs get printed with little wait time for users. 4Dejanski pridelek se lahko razlikuje glede na druge dejavnike, kot so hitrost naprave, velikost papirja in usmerjenost vira, pokritost tonerja, vir pladnja, odstotek samo črnega tiskanja in zapletena zapletenost tiskalnega posla.